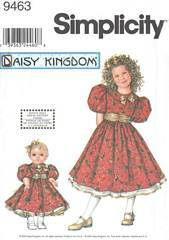 Daisy Kingdom sewing pattern for girls' dress and matching dress to fit 18 inch dolls. Dress cut crosswise with back buttons and short puffed sleeves has collar with ribbon bow, contrast gathered front sash with back tie ends, flared gathered skirt, contrast piping. Dress has attached slip with net ruffle with contrast binding or purchased binding. Ruffle extends below dress. Girls' Size 3, 4, 5, and 6 are all included. Pattern is uncut and complete. Envelope has storage wrinkling.